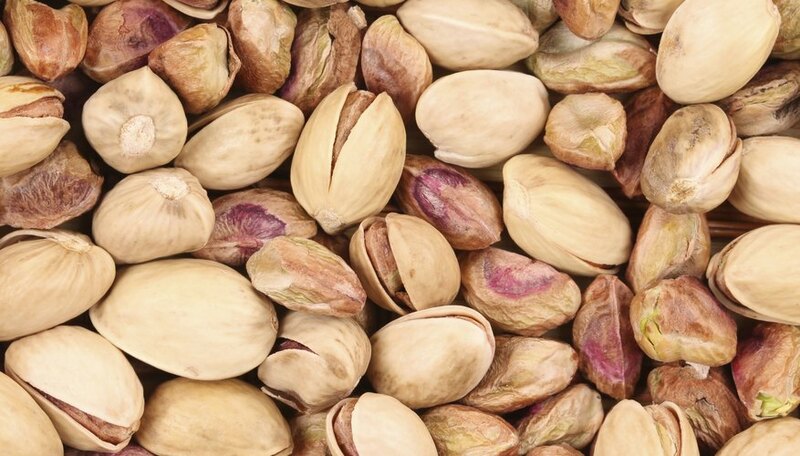 You don't have to compost or throw out pistachio shells after you've enjoyed them for a snack. Instead, upcycle them into a variety of craft projects, including faux flowers, rain sticks or mosaics. Create faux flowers or succulent plants for a permanent decor display using hot glue and pistachio shells. Hot-glue three shell halves together, pointy ends facing up, and open sides facing inward, to create a shape reminiscent of a flower bud. Continue gluing one shell at a time around the structure, applying the glue near the bottom of each shell. Work atop wax paper to prevent gluing the shells to your favorite work surface. Stop adding shells once you're happy with the shape of your creation; then make a bunch more for a decorative display. Spray-paint the finished pieces or dip them into fabric dye to give them any color treatment you wish. Display them in trays of peat moss or around a table centerpiece, or glue them inside a shadowbox frame for unusual homemade wall art. Create a new take on topiaries by using pistachio shells instead of greenery. Place a dowel or straight twig into a block of floral foam set in a plant pot; then press a foam sphere atop the twig to create the top of the topiary. Hot-glue shells, starting at the bottom, all the way around and up each piece of foam. Create several such topiary treatments, covering some with sphagnum moss instead of pistachio shells, for variation. Create your own take on holiday displays by using egg- or pumpkin-shaped foam instead, painting or dyeing the shells to suit your holiday color scheme. Pistachio shells and cardboard tubes team up to create a kid-friendly version of a homemade rain stick. Select sturdy cardboard tubes such as poster mailers; then poke or drill holes an inch or so apart randomly throughout the entire cardboard surface. If crafting with kids, an adult should handle the drill. Glue or duct-tape a piece of corrugated cardboard over one end of the tube, if it does not have a cap of its own. Twist long, narrow screws into the holes so the pointy end of each screw ends inside the tube without touching the other side. Fill the tube with a handful or two of pistachio shells; then attach the cap or homemade cardboard cap to the other end of the tube, taping it in place. Tip the tube almost upside-down to create a rain-like sound. Create your own mosaics by using pistachio shell halves dyed or painted different colors, using as many shades as you need to create a mosaic design. Plot out your design idea by drawing it on paper or a canvas the actual size you'd like for the mosaic. Color in each area, or write what color shell to use to create a guideline for your creation. Line up the shells atop the drawing to recreate the idea in shell form; then glue the shells down once you're pleased with the layout. Instead of complex mosaics, create simpler designs such as an ombre "fade" over the length of the canvas with successively lighter shades of shell. For a playful project for children, allow the children to draw faces on shell halves; then glue the shells to a piece of paper. Once the glue dries, they can draw bodies to go along with their pistachio people and animal creations.